Last week we started a series looking at the life and ministry of the Apostle Paul. Next to Jesus, Paul is perhaps the most influential person who has ever lived because it was Paul who established Christian churches throughout the Roman Empire which helped take the good news of Jesus to the entire world. Paul is the author of 13 of the 27 books of the New Testament and half of the book of Acts describes the journeys Paul made. Last week we heard how Jesus called Paul to stop resisting and surrender to him so that God could use him for his purpose and Paul finally did. Paul was baptized and started to trust in and follow Jesus. Paul was in Damascus when he accepted Christ and after preaching there for a short period of time he went into the wilderness of Arabia for three years. Galatians 1:17-19 We have no record of what Paul did during these years but it is interesting to think about how many of the people God called to be a leader spent time in the wilderness. Moses spent time alone on Mt. Sinai. The prophet Elijah spent time alone on Mt. Horeb and Jesus spent time alone in the wilderness after he was baptized. The wilderness is really just a vast desert area that is incredibly desolate and yet stunningly beautiful. Here are some pictures of the wilderness in Israel and as I stood and looked out, there were two things that came to me. #1 – God is huge and vast and powerful. Like standing on the top of a mountain and seeing for miles around – the vastness and power of creation are clear. The God who calls us is big and can do big things. 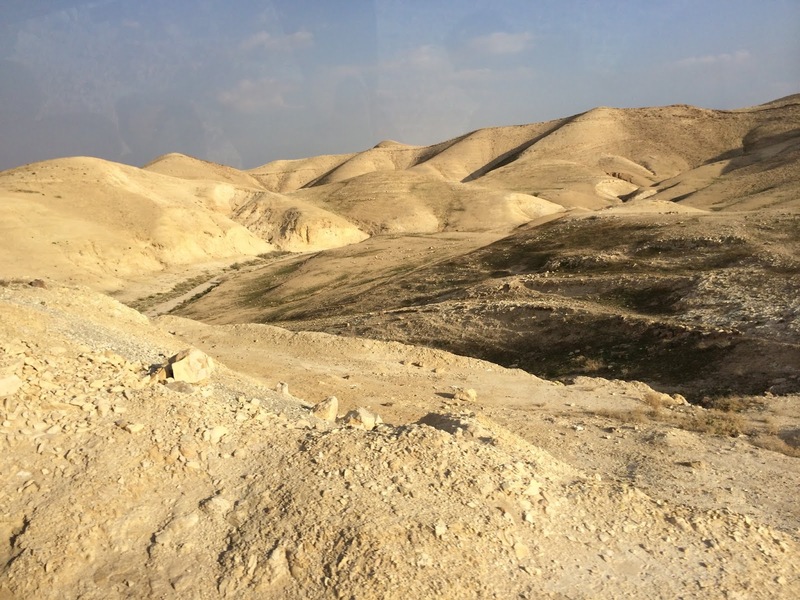 #2 – the wilderness is desolate, which reminds us how much we need God. The wilderness drives us to God in ways that nothing else can and perhaps that was what Paul needed. Paul needed time to be with God to rethink his life and his faith. His world view and theology had been transformed by the reality of Jesus and Paul needed time to rethink his life and the wildernessgave him that time to think and pray and listen. While most were afraid of Paul, Barnabas took a chance and met with him and it was Barnabas who was willing to introduce Paul to the Apostles. After that meeting, Peter and Paul met together for 15 days, but when some of the Jewish leaders heard about Paul’s conversion they wanted to have Paul killed. Paul has gone from persecuting the followers of Jesus to being persecuted for being a follower of Jesus so Paul fled for his life and returned to Tarsus, which was his home. For the next 10 years Paul remained in Tarsus and we hear nothing of what happened to him, but chances are good he went home to live with his parents. You see, nothing much changes in our world. A successful man with everything in front of him suddenly goes through a career change and ends up living with his parents. Think how difficult these years must have been for Paul. Paul was a driven and ambitious man. He had the best education, excelled in all things, had an experience with the risen Christ and been told that he was going to take the good news of Jesus to the Gentiles but now he was living at home. Many people face this situation. You get a great degree but then can’t find a job so move in with your parents. The company downsizes and you go from a position in management to no position at all. You feel called to a new career path but no doors open and so you just mark time for a while wondering if you heard right. Many of God’s leaders went through this same situation and a kind or in-between time. Joseph was told he would be a leader but then spent 20 years working in Pharaoh’s court and sitting in Pharaoh’s prison. Moses started out as a Prince but then spent 40 years in the wilderness as a shepherd. David was told he was going to be the king of Israel but then spent 25 years running from the current king, Saul, who wanted to kill him. These in-between years can be difficult but we need to remember that they are not the end. Joseph, Moses and David all became great leaders, their time in-between being called and finally having that call fulfilled was a time of growth and preparation. For each of them, and for Paul these were times of humility, times of learning and times of developing faith and trust. These are the times that prepare us for God’s future. We may not see all that God is doing in us through these times and we may not see how God is laying the groundwork for our mission – but God is at work. God is preparing us for more. God’s call in our lives and God’s ultimate call to “go” don’t always come at the same moment and this time in-between is a time for us to be faithful and prepare. God was preparing Paul. God taught him humility, perseverance, faithfulness and trust and none of these traits are developed quickly, they take time and in Paul’s case they took 10 years. Things started to change for Paul when a revival took place in the city of Antioch. Antioch was one of the largest cities in the Roman Empire with a population of about 500,000 people. It had a large Jewish population and many of those people started following Jesus but then many Greeks living in this area also started to follow Jesus. 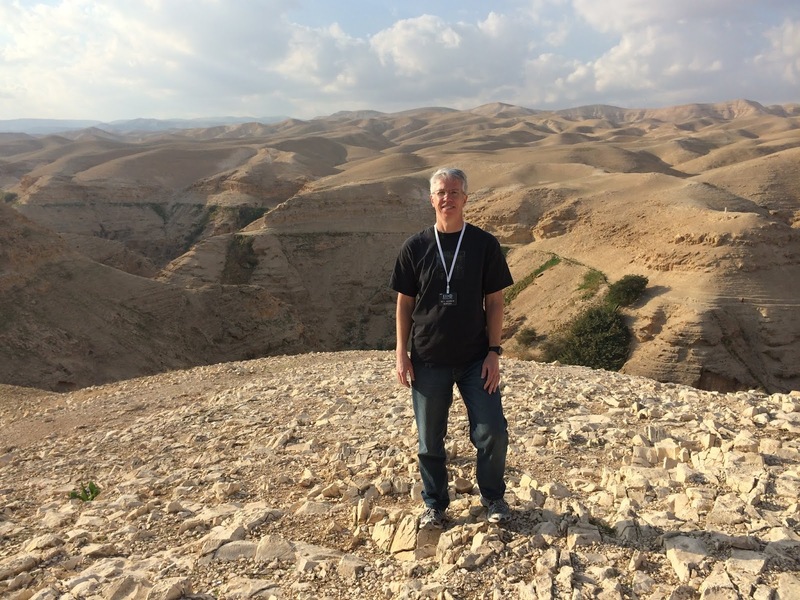 The church leaders in Jerusalem sent Barnabas to Antioch to see what was going on and when he arrived, Barnabas was amazed at what he saw God doing. True revival was taking place and leaders were needed to help organize and teach the people. Barnabas knew what was needed was a leader who was familiar with Greek culture and language, someone who knew the finer points of Jewish theology and someone who knew the power of conversion that comes with Jesus. There was only one person who fit this profile and that was Paul. So Barnabas travelled to Tarsus and found Paul making tents and brought him to Antioch to help lead this growing movement. This is the second time Barnabas has showed his faith and trust in Paul. First he was willing to take Paul and introduce him to the Apostles and now he gets Paul to help lead a revival. Barnabas believed in Paul. He saw gifts and graces in Paul and he opened doors for Paul to use those gifts. The name Barnabas means Son of Encouragement and that is exactly what Barnabas was – an encouragement. Paul’s life story shows us the importance of having a Barnabas or encourager in our own lives. We all need someone who will believe in us and encourage us. During high school my Barnabas was a couple named Ed & Jo Foster. They were my youth leaders who believed in me and trusted me and called me to step up and lead at times when I wanted to walk away. Every church I have served has had a Barnabas – a person (or people) who have seen more in me than I ever saw in myself and who encouraged me to keep going. Many of you are a Barnabas to me by your prayers, words of encouragement and trust. Who has been a Barnabas in your life? Who has encouraged you to do more than you thought you could do and be more than you thought you could be? Who believed in you when no else did and who has given you opportunities to learn and grow as well as fail and succeed? Maybe it was a teacher or coach, maybe it was a mentor or friend. Your encourager could also be your spouse or parent or grandparent. We all need a Barnabas and we all need to be a Barnabas to someone else. So let me ask you, Who are you encouraging? Who has God placed in your life that needs to be encouraged and called forth to greater things? Who needs you to invest in them so they can fulfill the plans God has for them? God places people like this in our lives all the time and it is up to us to see them and encourage them. Step out and encourage someone today and see what God will do in both your lives. It is important to notice where this call of God took place. Paul and Barnabas were in worship. God uses times of worship and prayer to call us and to make that call clear. I was called to preach while I was preaching during worship. I was serving as a student associate pastor while in seminary and struggling to figure out if I was called to the local church where preaching every Sunday is obviously a big part of the ministry. I wasn’t sure this was for me until I preached the first time during worship. My sermon that Sunday asked the question, what is it that we beg from Jesus? Do we beg Jesus to save us? Or do we beg Jesus to leave us so we can live our own lives? As I was preaching the thought came to me – who am I to tell these people how to live their lives? And I am not kidding when I say that immediately on top of that thought came this one, there is nothing else I believe and there is no other message worth proclaiming than the message to follow Jesus. That time of worship was part of God’s call for me to be a local pastor, and worship continued to help shape that call. Worship helps prepare us for all that God wants to do in our lives. Worship is often a time when we are more open to God’s spirit and leading and take the time to listen for God’s voice and so worship is a big part of how God prepares us in all seasons of life. Paul and Barnabas heard the call of God during worship and they followed that call and went on what became for Paul his first missionary journey. Paul and Barnabas first sailed to Cyprus because this was Barnabas’ home. They started in a place that was familiar and where they had connections and before they left Cyprus the roman governor of the entire island accepted Christ. 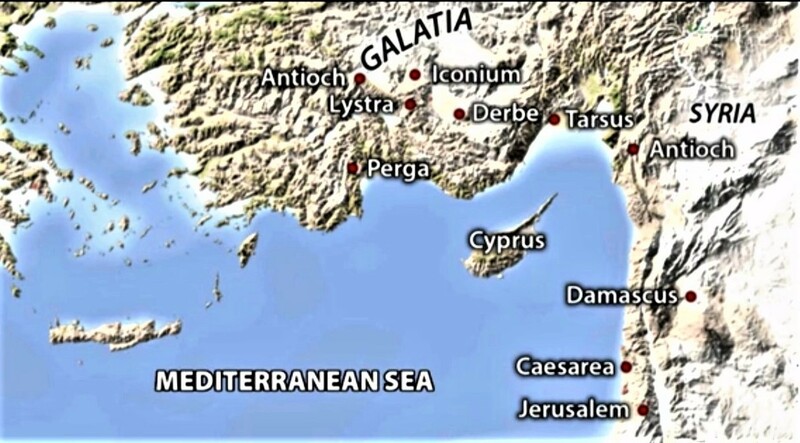 From Cyprus they sailed to Perga which is in modern day turkey but it say they didn’t stay in Perga but immediately went up to Antioch in the mountains. 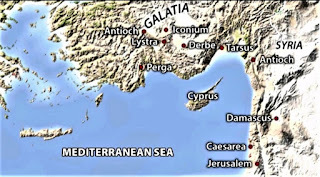 We don’t know why Paul did this because usually Paul would preach where ever he landed and he seldom bypassed cities, but we can speculate that Paul didn’t preach in Perga because he was sick. Galatians 4:13. 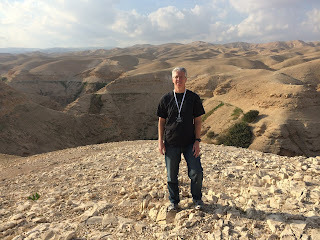 It makes sense that if Paul was not feeling well that he would have left the port city which was hot and humid to travel into the mountains where it would have been cool and dry. While we don’t know what Paul’s illness may have been, there are some who think Paul was suffering with an eye infection because he tells the Galatians that if they could have they would have torn out their own eyes to give to Paul. Paul’s writings also hint to the fact that he had trouble with his vision but it never slowed him down. The Jewish leaders in Antioch were jealous of Paul and the crowds that he was drawing. They felt he was a threat to their position and power and community so they drove him out of the city. Instead of giving up and going home, Paul traveled to Iconium. Now in Iconium, the same thing happened only this time the people wanted to kill him so Paul left and travelled to Lystra and then Derbe. In Derbe, Paul not only faced opposition from the people there but leaders from both Antioch and Iconium followed Paul to stir up trouble. Now we might think that Paul would have finally had enough of all this conflict and what seems like failures and just skip on over to his home in Tarsus – but he doesn’t. Paul returned to Iconium and Antioch where has been run out of town so he could keep preaching and teaching and then he made his way back to Perga so he could share the good news there before sailing back home. Paul was prepared. Paul was encouraged. Paul was persistent. Paul was prepared. Paul’s 3 years in the wilderness and 10 years at home prepared him for this journey. Those years taught Paul how to depend on God and how to keep going in the face of disappointments and obstacles. Paul’s time of preparation taught him humility and how to do things for God’s glory and not his own. It taught Paul how to listen to God and be faithful to God. These 13 years of in-between time were not wasted years, they were times of preparation. God gives all of us seasons of preparation. We might feel like we are treading water, running on that hamster wheel getting nowhere or just marking time, but we need to look at these seasons as times of preparation for the mission that is coming. How is God preparing you in this season of your life? Is worship part of that season and are we taking full advantage of where we are today? Paul was encouraged. Paul would have never made that first journey if it had not been for Barnabas. Barnabas was the one who took Paul to Antioch where the call came and having Barnabas on the trip helped Paul keep going because Barnabas was the encourager, the cheer leader and the one who kept Paul going. Who is encouraging you? God places a Barnabas in all our lives but we have to be willing to see them and hear their words of encouragement and at times go with them. Paul was willing to listen and go with Barnabas not once but twice and we have to be willing to listen and step out in faith with those who are encouraging us. Paul was persistent. He kept going. When it would have been easy to give up and go home – Paul stayed faithful. The reason Paul kept going was because his time in the wilderness taught him how to depend on a Big God who had Big Dreams. Paul believed in his call but more importantly he believed in the God who called him. When it comes to following God’s call in our lives we need to be persistent. Nothing comes easily. We will face disappointments, sickness and failure but when we have heard God’s voice and trust God’s call we can’t see those things as signs telling us to stop but obstacles to overcome because the one who has called us to go will always go with us. The God who called us is Big and God has BIG Dreams for us. So listen to God’s call in your life. In worship, prayer and reflection hear the call, prepare yourself, walk with others and step out in faith never looking back and never giving up. How is God preparing you during this season of your life? Use the following spiritual disciples to help God prepare you for the future. Name the people who have encouraged you in life. · How did their words and actions help you do more than you thought you could do and be more than you thought you could be? Who has God put in your life today to encourage? · In what specific ways can you be an encouragement to that person this week? Read Paul’s First Missionary Journey – Acts 13:4 – 14:28. Identify all the times Paul persevered when it would have been easier to give up. How did Paul’s preparation help him keep going? How did the presence of Barnabas help keep Paul going? What obstacles do you need to push through? Where do you need to persevere through disappointments and failures?